RS232C or RS485 for Sensor or Meter Interfacing such as Energy Meter, Flow Transmitter, Gas Transmitter, Analyzers. The PM020-AutoSampler is a extremely low power SMS alert Unit designed to work with autosampler for up to 5000 Hours standby (base on 12V 5AH Battery). The unit can be power from the Portable AutoSampler internal battery, or can be powered separately via external power. This unit is designed for SMS alert operation for event triggered operation such as Sampler Run and End Of Program Output. Optionally one channel can be connected to external raingauge to log rainfall data and send the data every day to a central monitoring system. 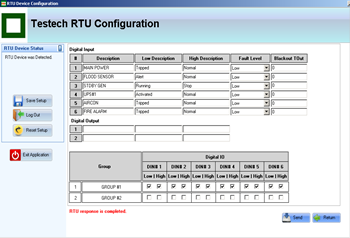 The RTU will wakesup only upon event trigger (Sampler Run, Program End) and send us SMS. Upon successful sending of SMS (or timeout) the RTU will immediately power down to save battery. Customised Enclosure is possible to IP67. PM020-AutoSampler was redesign with native USB High Speed Interface with an embedded USB Device Stacks for HID. No RS232C is required. Built In Battery Backed RealTime Clock/Calender. All Event are date and time stamps to record the actual time of alarm. RealTime Clock/Calender has its own Lithium Battery Power Source for at least 10 years of Clock Calender and Alarm Functions. The battery is independent of the primary battery for the entire unit. Optional Onboard Solid State Flash Memory provides 1MBYTE of Datalog memory that is not affected by battery.